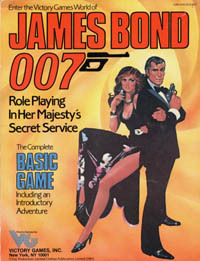 The cover of the original 1983 edition of James Bond 007: Role Playing in Her Majesty’s Secret Service. Dungeons & Dragons, the world’s first roleplaying game, was published in 1974. It’s amazing to think that by 1983, there had been so much development in the artform that it could produce the kind of quality you see in James Bond 007. In less than ten years, roleplaying games went from tentative beginnings to a modern-looking game. I say “looking” because the first thing I noticed about 007 was that it’s the first roleplaying game I read during this project with a nice, readable layout. Most of the games I’ve read so far have been presented with the graphic vision of an antique phonebook, with endless tiny type and ugly illustrations. Not here! The spreads are attractive and they’ve clearly paid attention to how information is presented to the reader. James Bond 007 feels like a level-up in many other ways too. It’s clearly focused on replicating the kind of action you see in the movies, with a basis in genre and not realism. James Bond goes to exotic cities, engages in car chases and flirts at casinos. Thus, the book provides the necessary systems and information for all of this. The basic system is very Eighties in its pointless complexity, but it has some nice touches. Chase mechanisms are a common point of failure in roleplaying game design, and James Bond 007 really goes all in there. The chase system is as extensive as the combat system, designed with the idea that a chase will be intricate, exciting and full of tactical decisions. Another fun detail concerns character appearance. You buy your appearance level with points, but the twist is that the cheapest option is where you’re the most handsome or beautiful. Being plain costs the most. The justification for this is that looking good makes the character more recognizable, but there’s a strong incentive just to make your character into a hot superspy. Perhaps somewhat surprisingly given the reputation of the James Bond franchise, the game is also more gender-inclusive than some others from this era. It consistently assumes that both players and characters can be men and women. The illustrations show women in action scenes doing cool stuff. From a historical perspective, James Bond 007 feels like a precursor of design trends to come. If you squint a little, you can make out the beginnings of games where story and style reign supreme.